Champion Sea Jetboat is a Speed boat with double DOHC 4-TEC engines,and it’s Direct Drive Jet Propulsion system. It is with six-seater,and enough for your whole family enjoying the summer time. -B&R SYSTEM: Brake and Reverse (B & R) system offers a new way of safety and control. If the watercraft is moving forward, pull up the brake to slow down. If it's stopped, then go in reverse. -Intelligent Engine Overheat Portection(IEOP): Designed for keeping the engine much safer. 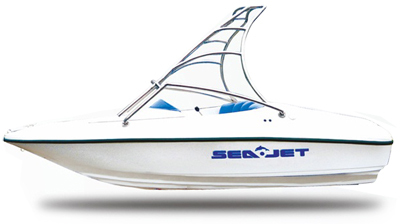 Ensures Champion Sea Jet Boat J1 watercrafts longer than others. Double 1400CC4TEC DOHC Suzuki Inboard Engines, high performance and reliability. EU certified.